Available individually. 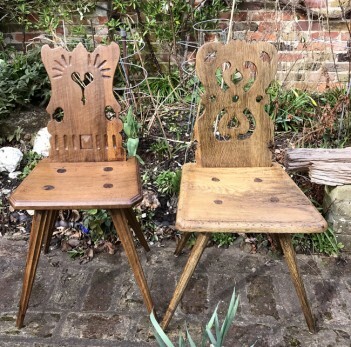 These are alpine wood chairs, the fruit wood (probably cherry) chair (shown on the left) is antique, handmade and carved using traditional methods. It has lots of charm and the grooved legs are a stunning feature. The chair has been stripped, mended, sanded, polished and waxed. All woodworm holes have been treated. The chair on the right is another Alpine wood chair but this one is Oak (shown on the right). This is also antique, handmade and carved using traditional methods. It too has lots of rustic charm. The chair has been stripped, mended, sanded, polished and waxed. All woodworm holes have been treated. Please click on the photos to see larger and alternative images. The individual chair shots are the "before" photos and the photos showing the chairs together are the "after" shots.